For everyone who uses my book, ‘Fun, Games and Party Pieces for beginner piano‘, here is an extra tune which fits perfectly with the third tune in the book, ‘Chinatown’. 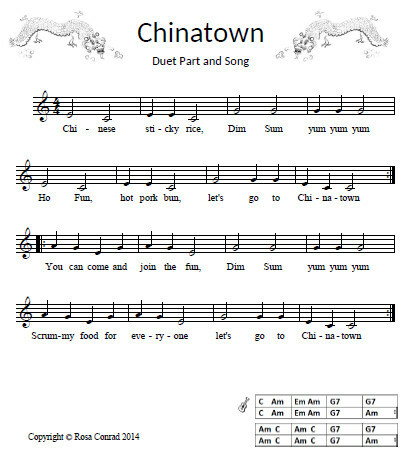 ‘Chinatown’ is proving popular with my pupils, and I figured if there is a song to go with it I can get lots of them joining in together at my next Big Fat Music Party. Thanks to Bay and Katie for their help with the lyrics. This entry was posted in Fun Games and Party Pieces Beginner, music teaching, piano, sheet music, singing and tagged beginner piano music, Chinatown, Fun, Games and Party Pieces, piano, singing, song. Bookmark the permalink.